Your webmaster has been slowly reading through old issues of The Trader Speaks, one of the more famous hobby publications in what I think of as the "pre-explosion" days. 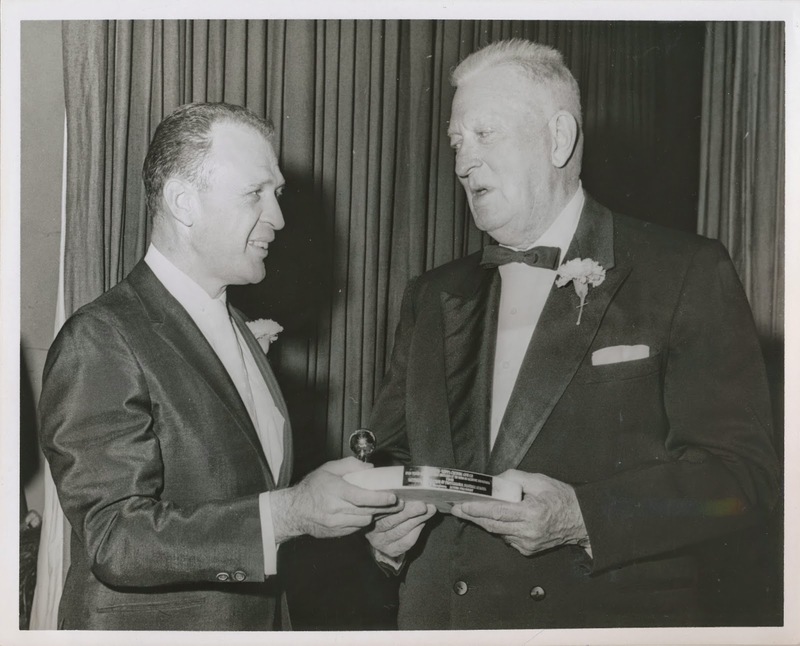 TTS was published from late 1968 until the Fall of 1983 by Dan Dischley (a co-founder of SABR) and then, following a sale, sputtered along for another six months or so before Krause Publications bought the mailing list and the magazine was shut down. Krause, publishers of Sports Collectors Digest, attempted a 1989-90 resurrection as an SCD insert but pulled the plug, once and for all, after twelve issues. It's been an interesting thing, reading them in chronological order and you can spot early trends this way. 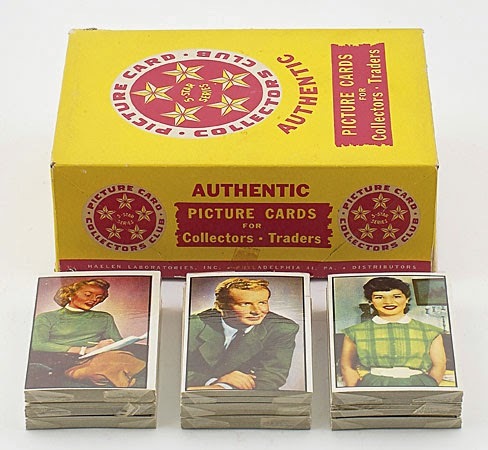 There was huge interest in the Kellogg's 3-D cards in the early 1970's, a clear surge in hobby interest in the media and among collectors in 1973, the sprouting of collector conventions around 1974-75 followed by an influx of large dealers around 1976. The focus of course, was on baseball. 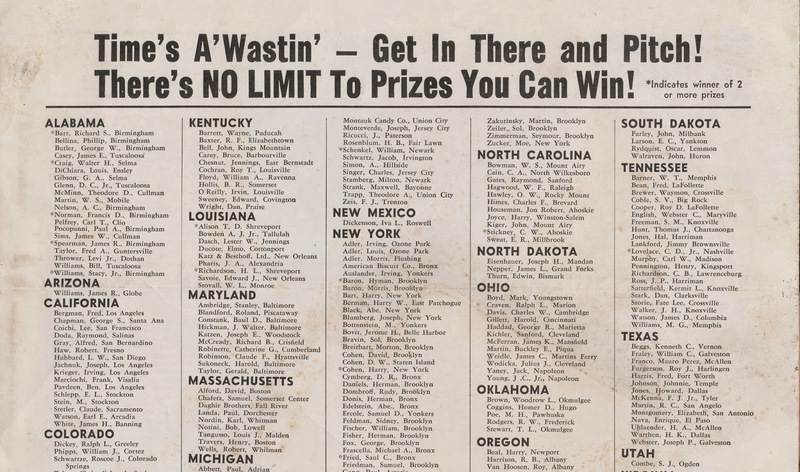 It was around the Bicentennial that a number of Price Guides sprang up as well, each seemingly larger and more comprehensive than the last. 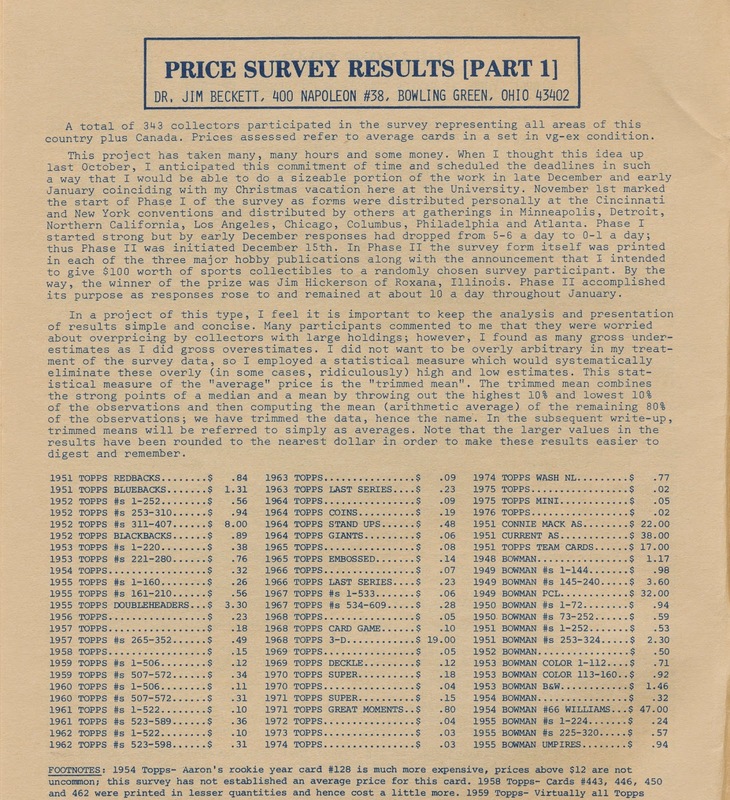 Now, when you think of early guides you think of Beckett but he was a latecomer as a half dozen or so had been published before he had Dischley run a centerfold pricing survey in the January 1977 issue. As noted by Dr. Beckett, the pricing was for VG-EX cards. 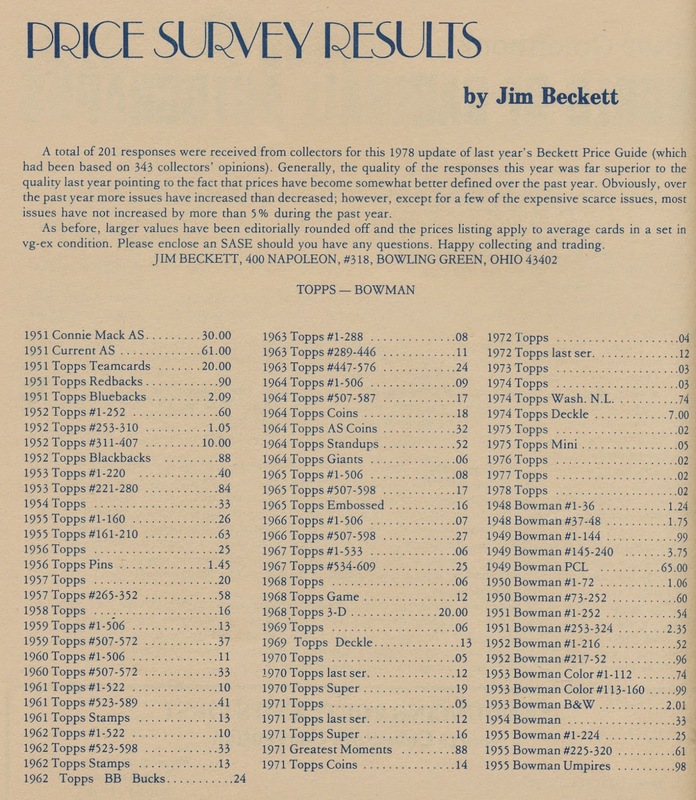 The 1951 Blue Back pricing is consistent with current trends when compared to the Red Back set and the $8.00 assessment for 1952 high numbers is essentially sixteen times higher then a common. It's about nine times as much for a high number these days, which reflects the reality the highs are not all that difficult. 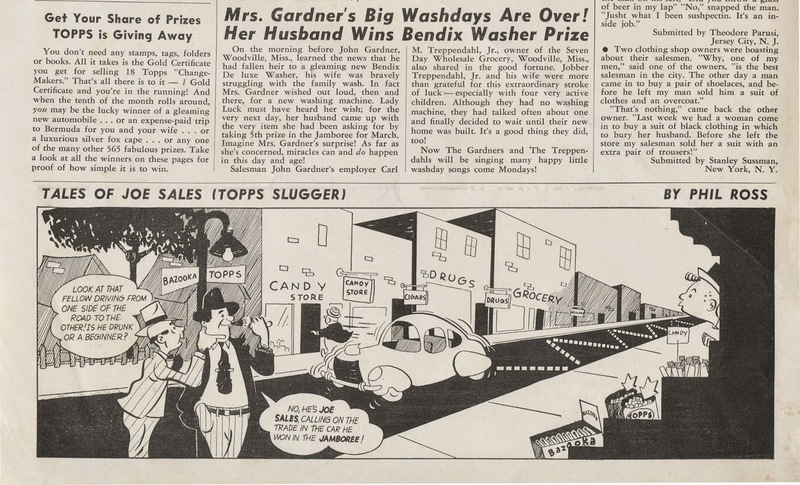 Beckett also may have inadvertently started the notion that the 1952 semi-highs started at #253 as there were plenty of ads in early TTS issues that showed they began at #251. 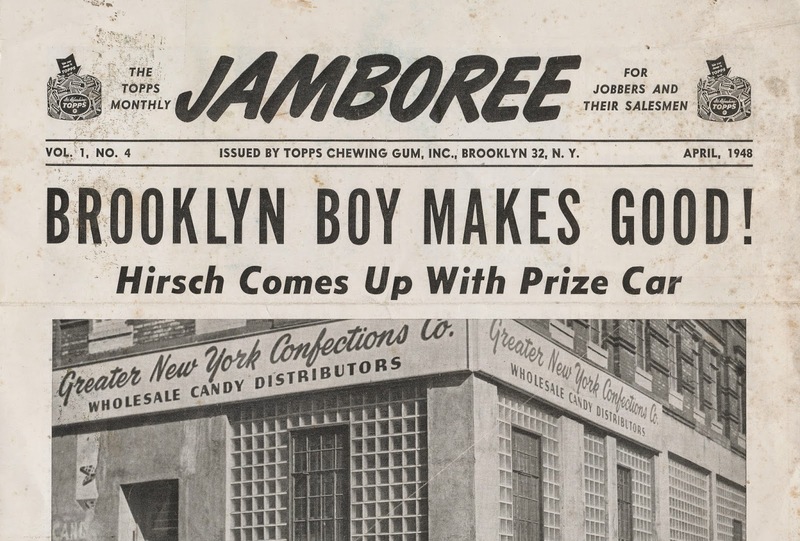 The other 1951 Baseball Candy issues also show their scarcity. The $38 for a Current AS (Major League All Star) is tied for the highest amount for any set surveyed by Beckett; those are not even double the Connie Mack All Star prices, while these days it's more like 2.5 times. The Team cards that weren't shortprinted sell for less these days in comparison to the Connie Macks, less than half in most instances. You could buy the Team cards fairly readily from TTS advertisers in the early to mid 70's and the occasional complete Connie Mack example but I have yet to find an ad offering a complete Major League All Star card for sale in the first 100 issues or so and there were numerous buy ads for them.The 1968 3-D cards were also impressively priced. The comments on the 1970-73 high numbers are interesting and while the 1971 and 1973 nosebleeds are not all that tough these days, 1970 and in particular 1972 highs are thought of as relatively difficult now, considering the volume of low numbers produced in those years. Bowman PCL cards also remain near-impossible to find almost forty years later. 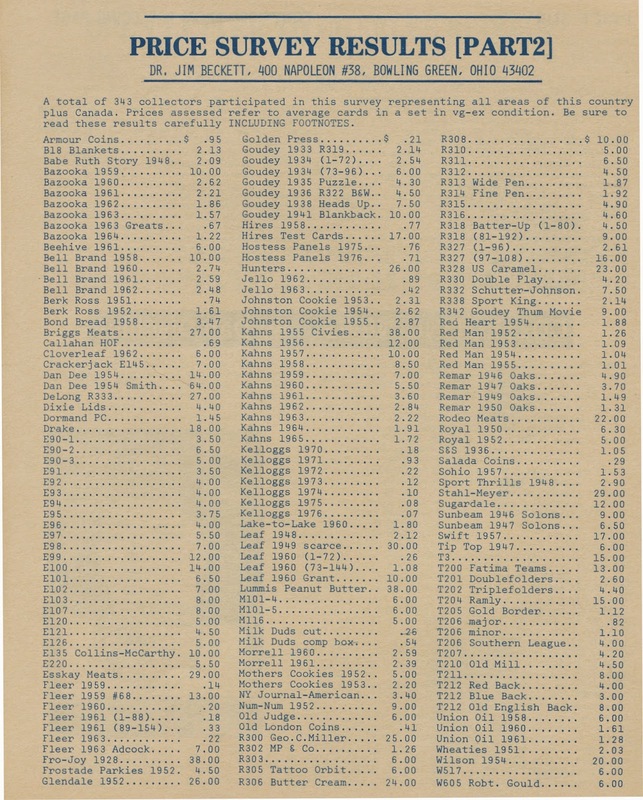 You can see that except for the 1954 Dan Dee Al Smith, which is a super short print, the Major League All Stars compare with the 1928 Fro Joy, Lummis Peanut Butter and 1955 Kahn's sets as the most expensive out there. This is no longer true as the Fro Joys have dropped significantly while the Kahn's (which feature a half dozen Reds players in street clothes) have kept pace, or even slightly surpassed the Topps offering. 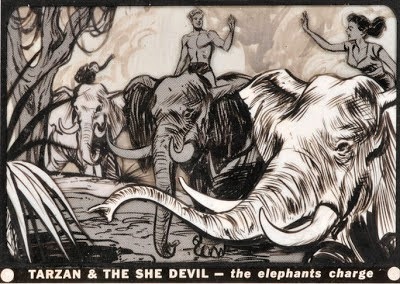 The SCD "big book" states the Kahn's cards were only given away for one day at a amusement park in Cincinnati, indirectly illustrating how scarce the MLAS's really are. Prices were coming more into focus the second time around and the PCL issue from Bowman in 1949 was now the king of commons. 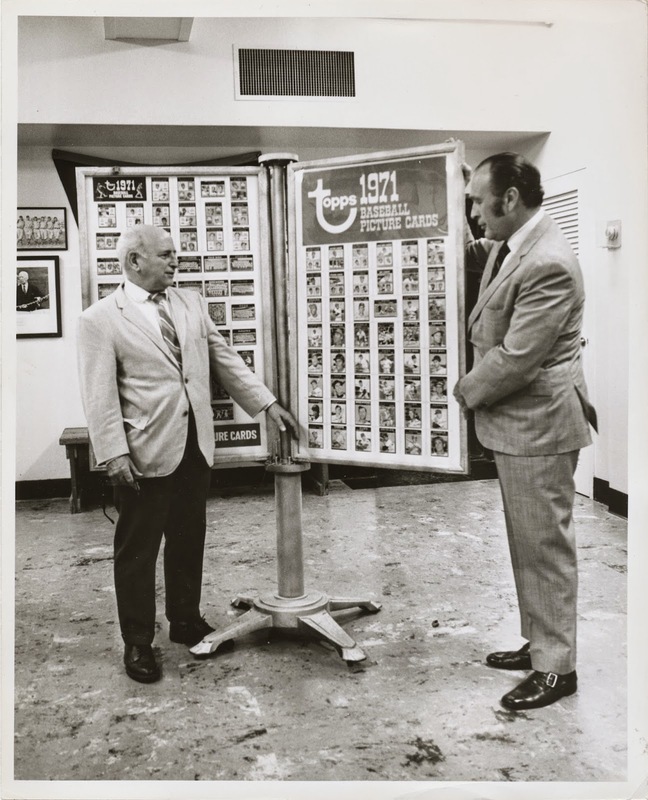 As an aside, a complete PCL set had been auctioned the year prior and instead of accepting a cash bid the seller, a Chicago sports store, took 900,000 baseball cards in exchange for the set! As it turns out, Dischley was issuing the second edition of his Modern Baseball Card Checklist Book in the summer of '77 and it would include Beckett's first stab at pricing. I have the 1979 edition and while it includes pricing, I don't think it was Beckett's any more since his first Sport Americana Baseball Card Price Guide (in conjunction with Denny Eckes) came out in February of that year. I have further runs of magazines to go through as I continue my research and expect I will find similarly blog-worthy old school items along the way. Santa came to the Main Topps Archives a bit early this year, after I purchased a nice lot of Topps items in October. I've shown B&W scans before but here is the living color version. These cards are tiny and clearly meant to accompany a gift of some sort and each came with a similarly small envelope. My guess is a bottle of booze was the gift of choice. I have to say, for a bunch of Jewish guys from Brooklyn, Topps sure did put on a good show at Christmas! See you after the presents are opened-Merry Christmas and Happy Holidays to all of you out there! 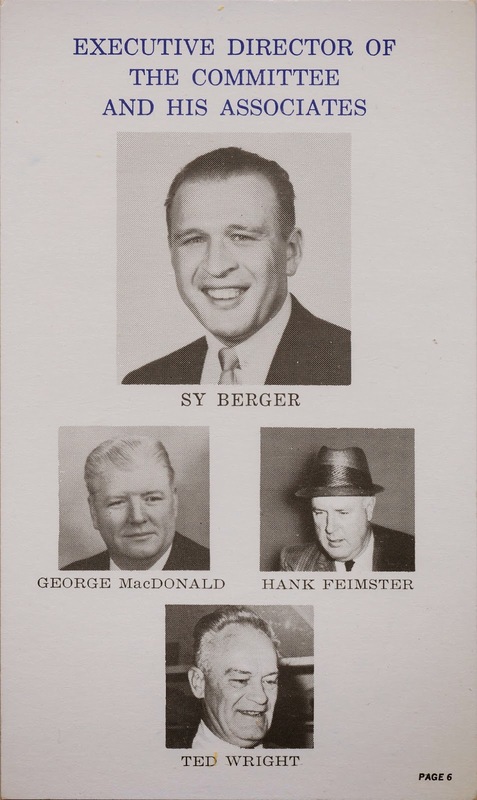 Sy Berger passed away in his sleep yesterday at the age of 91. 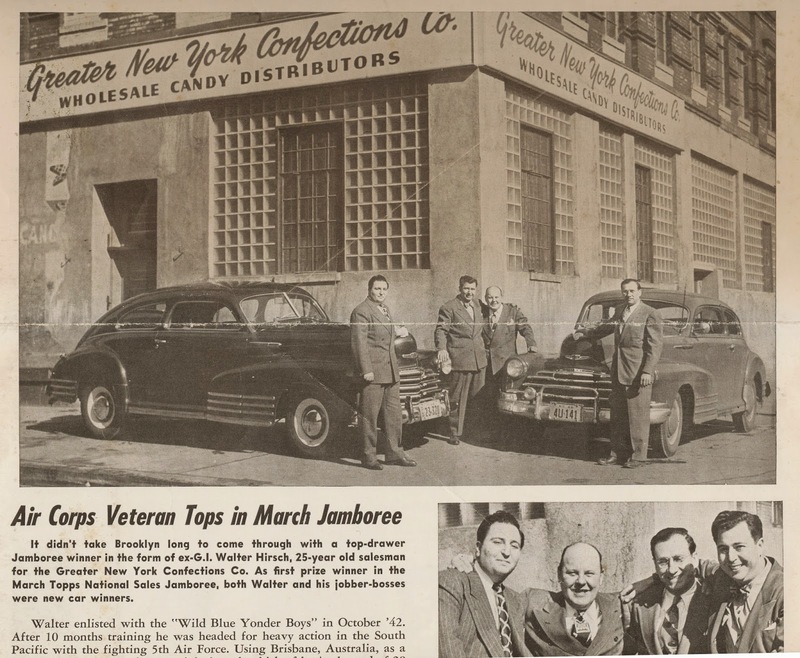 He began working at Topps in 1947 and by 1951 had become such a key man he was entrusted to create the 1952 Baseball set along with Woody Gelman. I've said a lot about him here and in print previously so will just offer up best wishes to his family. RIP Sy, you were one of the best things to happen to us baby boomers. If you really want to drive yourself batty, try giving some of the 1960's Topps CFL inserts sets a go. I don't collect full sets, only an example of each set, issued by Topps through 1980 but I also seek out examples from their Canadian issues. 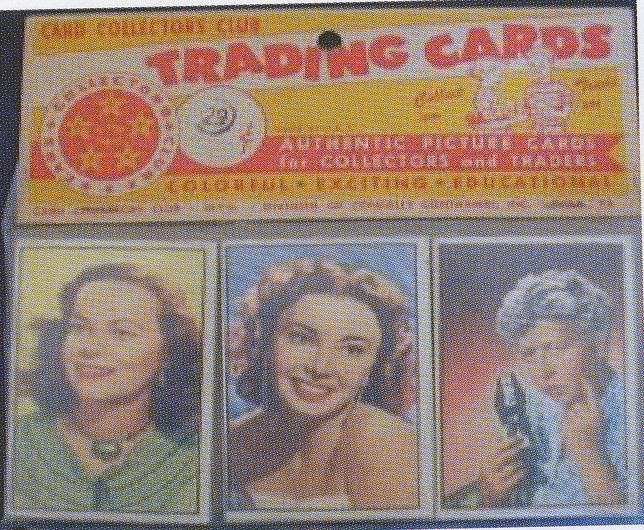 Some of these are branded as Topps products and others were issued under license by O-Pee-Chee. I've covered the inexplicable eight year run of Topps CFL cards here and here in the past and today want to examine the first insert CFL set from 1961. Well as you may have guessed, there are not 27 known subjects but only 24. According to Andy Malycky's ridiculously comprehensive Collecting Canadian Football Volume 1, which is my go to guide for Topps and OPC CFL information (and from which the above back scan is pinched), only 24 have surfaced and the set may be complete at that number. Topps often printed their insert sets in multiples of 12 so 24 is a reasonable landing spot. 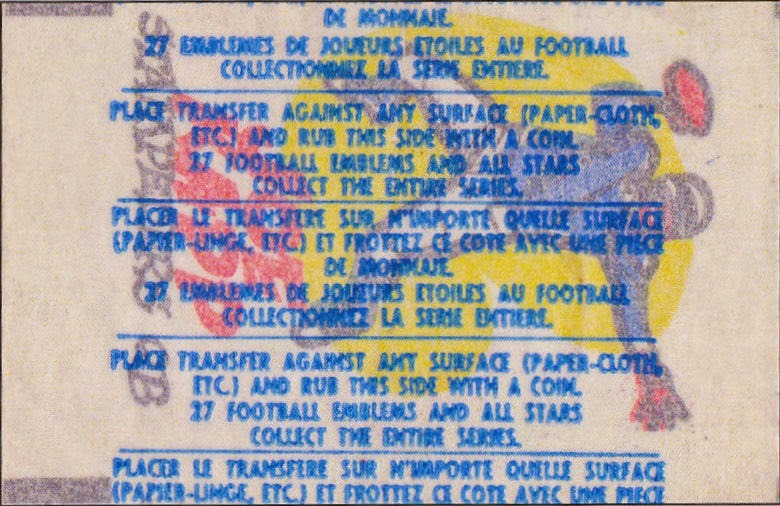 There were 9 teams in the CFL in 1961 (the Western Conference played 16 games and had five teams, while the Eastern Conference played 14 games with four teams) and all nine logos have been accounted for as the Calgary Stampeders, Ottawa Rough Riders, Toronto Argonauts and Winnipeg Blue Bombers were issued in addition to the teams shown in the scan above. With four players produced that are also not shown above (Don Clark, Gene Filipski, Ron Stewart & Dave Thelen), all teams have three subjects except for Edmonton, Montreal and Toronto, which are each missing a player for a perfectly balanced issue of two players and one logo per franchise. 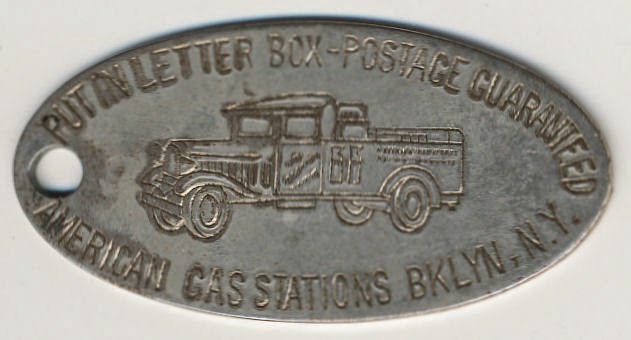 Malycky states that no unopened was packs are known to have survived from the 1961 CFL issue so the odds of missing subjects hiding in unopened product are astronomical. Were the three missing players produced? Probably not but the set is so hard to piece together anything is possible. I have posted many times about the practice of Topps to take jobber-returned or unsold card inventory and rewrap it in any of umpteen formats to resell at some point past the original issue's shelf life. Recently a very strange Rack Pack showed up in an article in the latest issue of The Wrapper, the Les Davis helmed non-sport magazine (hi Les! 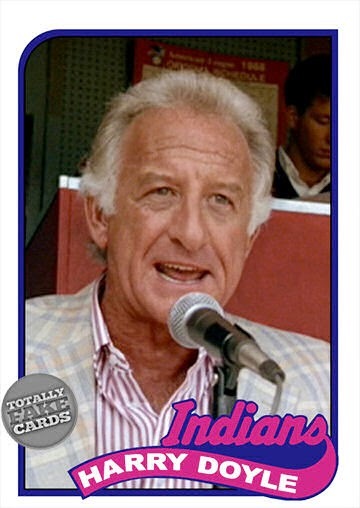 ), that shows just how far Topps was willing to take the concept. There are three 15 card cello packs within and as you can see Power for Peace (1954), Frontier Days (1953) and U.S. Navy Victories (1954) cello's are in this rack. 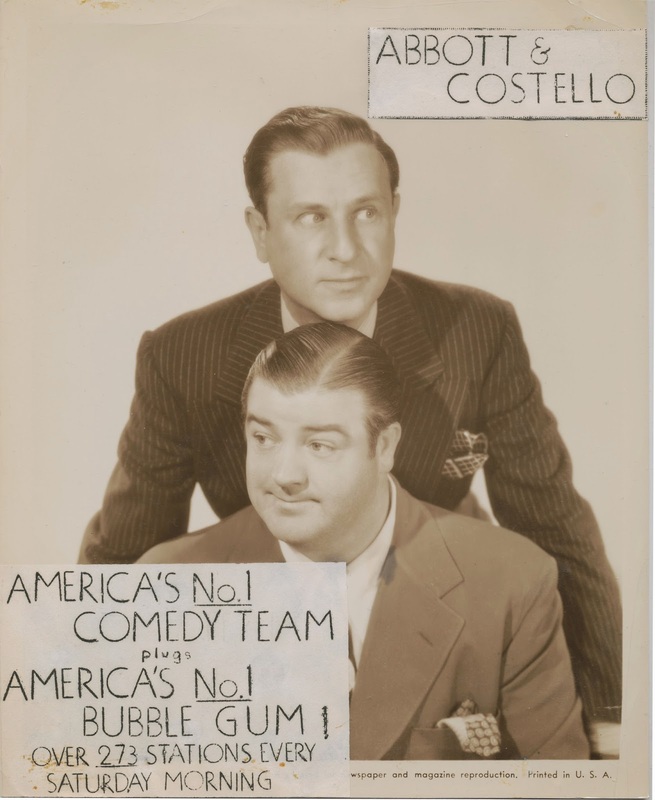 Others have been described as containing Television & Radio Stars of the National Broadcasting Company (a 1953 set). 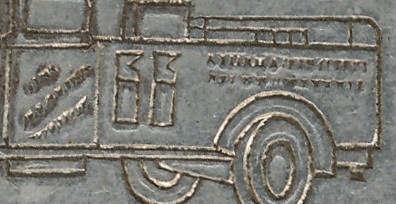 There could be others as multiple racks were found and the header card indicates as much. The article states that Juka's research revealed these were packs issued by Topps following their takeover of Bowman in early 1956. You can see the "Collect 'Em Trade 'Em" motto is on both headers and the Card Collectors Club branding but it's a completely different configuration. 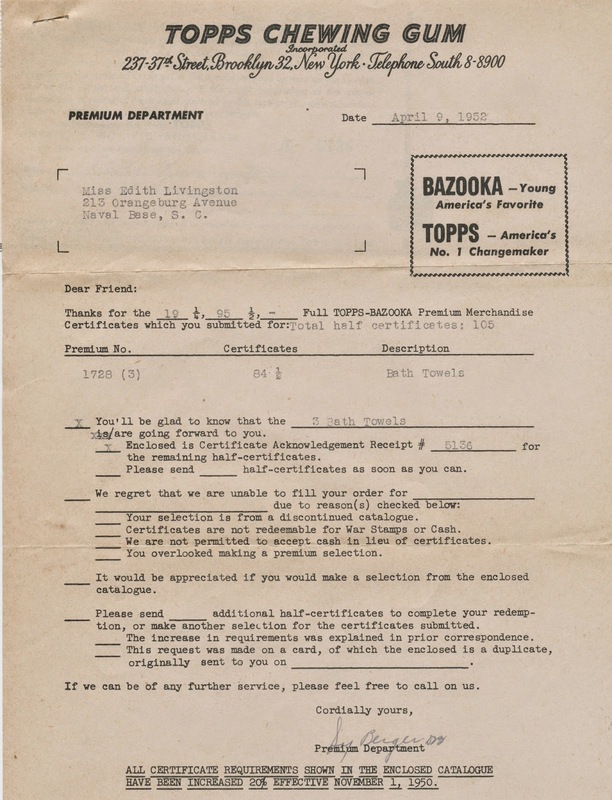 Topps had their own collectors club at the time (Trading Card Guild) so deleting that reference would make sense on the racks discussed by Juka. Centering was clearly an issue! 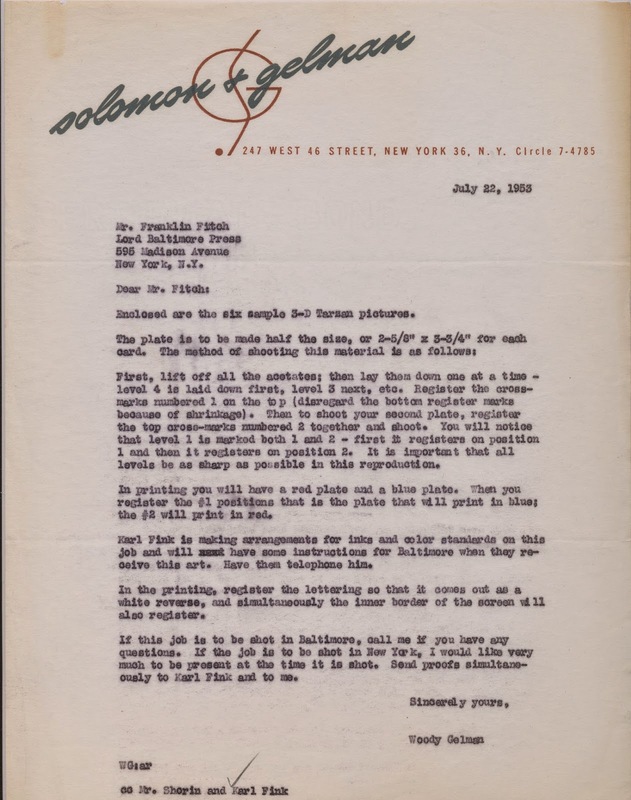 Another writer for The Wrapper, friend o'the archive Bill Christenesen, recalls buying 1953 Bowman Baseball cello's that had been reissued around 1956 so they could have come from either Topps or Bowman depending upon the exact date. They could even have been deconstructed from the "Juka" rack and sold individually by an enterprising merchant. Does anyone out there have other Bowman racks they can show? The actual Jobu, by the way, still carries on. That ersatz Doyle is courtesy of Chris Olds over at Beckett. That's well worth a click as there are more fantasy cards from the movie/set over there. 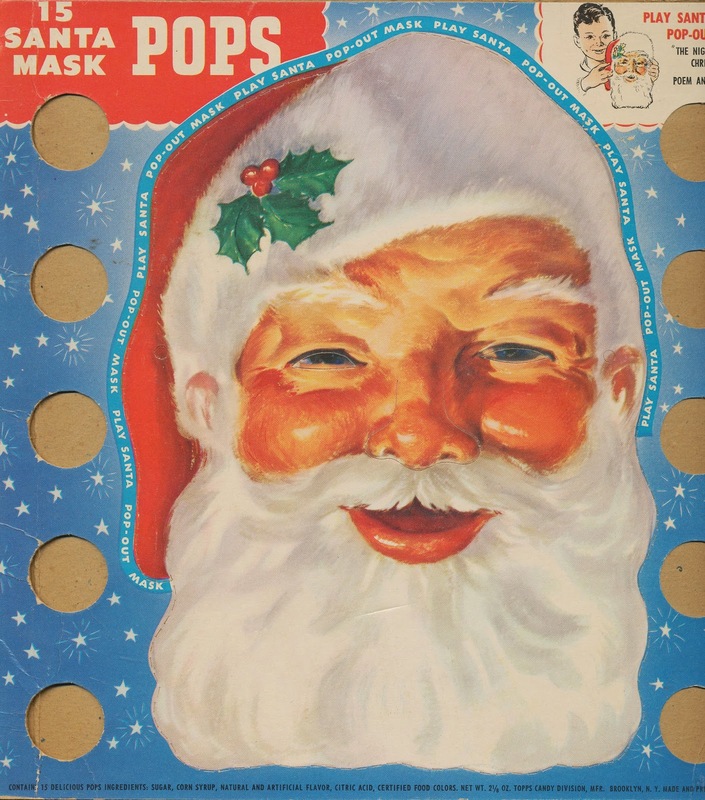 While the marketing and timing of the larger set in a big boy wax pack was set up to stimulate sale over the summer, I'll bet some folks will spring for these as stocking stuffers. I'd love to do a roundup of all the weird little promotional sets and one offs like this Topps has produced over the years. There are a number of them, some of which I have covered here previously. Many are not well publicized, especially the single cards designed for actual use in a film or given out at awards functions. I believe these types of sets have seen increased production in recent years. 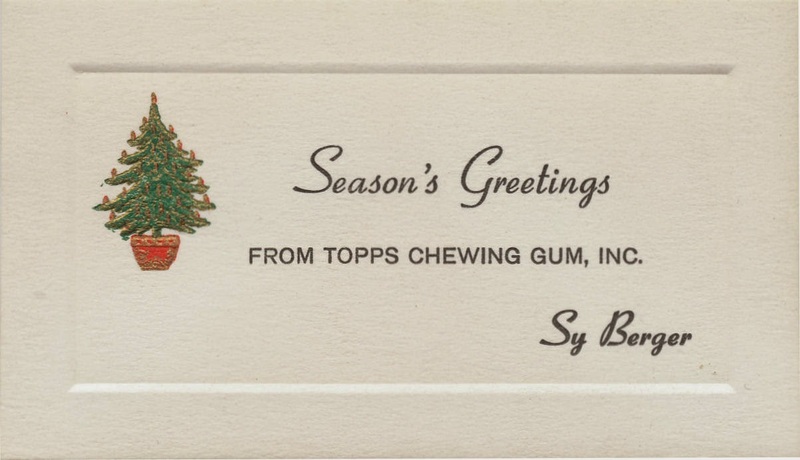 This letter also clues us in that Lord Baltimore Press, which printed most of the Topps cards sets through at least the late 1950's -- before International Paper changed the operation a couple of years after acquiring LBP in 1958 into a folding carton manufacturer -- could shoot the artwork in either Manhattan or Baltimore before it was sent to the printing plant in Baltimore. Topps of course switched over to Zabel Brothers of Philadelphia to print their cards once LBP got out of that line of work. 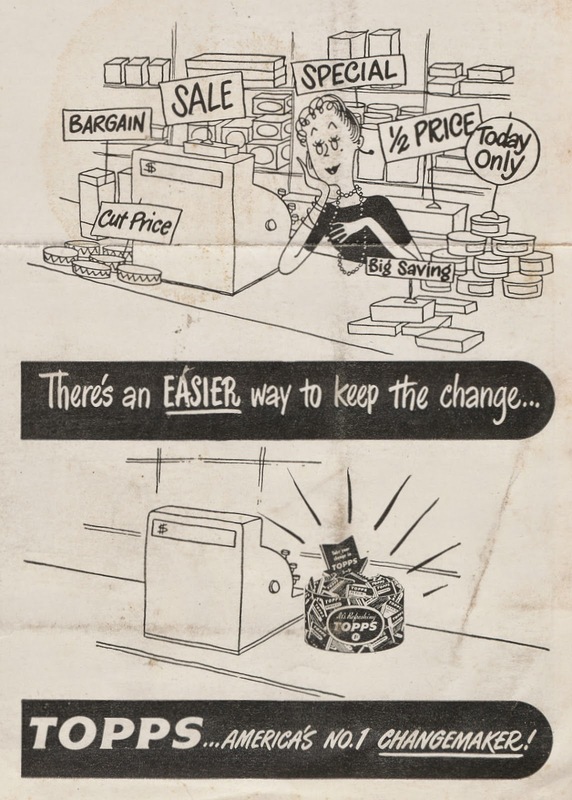 Gonna span the decades today kids...by way of a sideways look at premium offers. 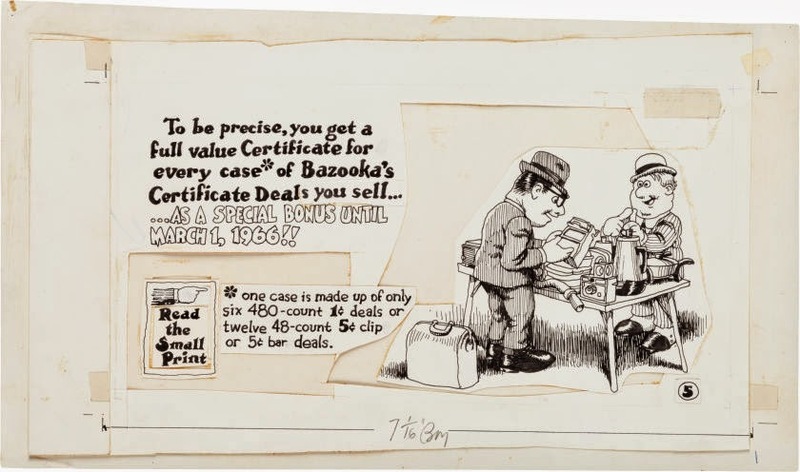 You remember of course the retailer premium certificates we have looked at a few times previously; some of the posts that are germane to this discussion can be found here, here and here. 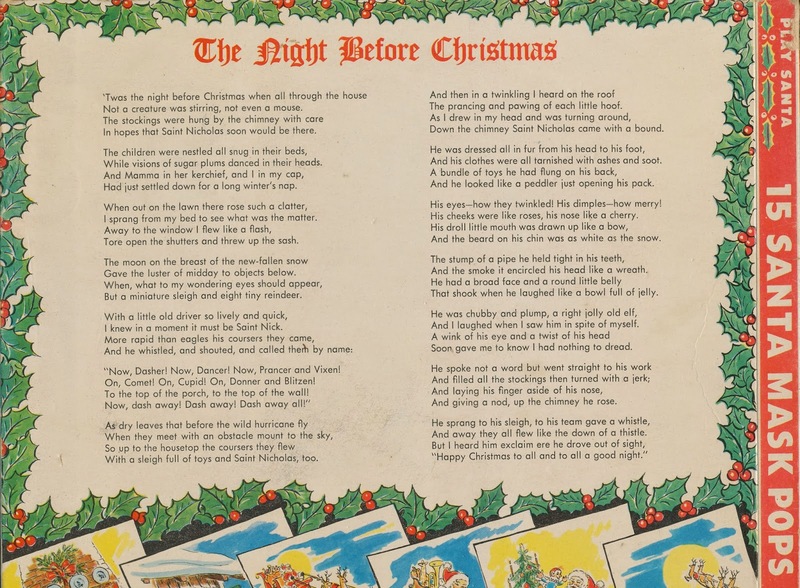 The gist was the more a retailer sold, the more he or she could accrue toward gifts, some of which were quite nice. 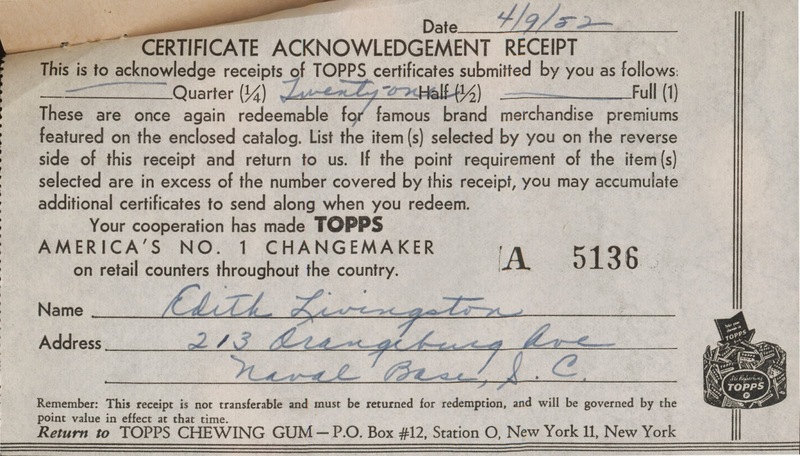 Well all those certificates had to be mailed somewhere and that somewhere was Topps HQ in Brooklyn (albeit until the early to mid 1950's it was via a PO Box). So what happened to each redemption once it hit Brooklyn? Well thanks to a recent pickup of mine, it can be told. 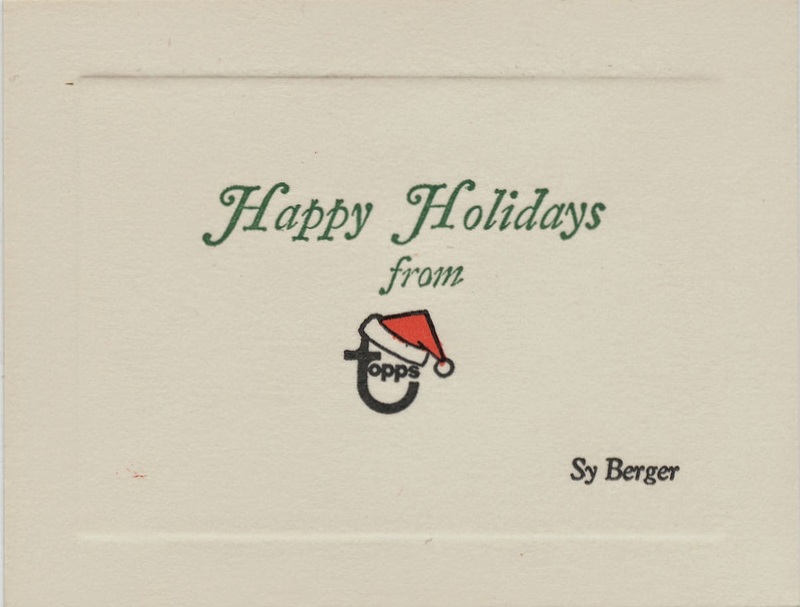 Yes, Sy Berger himself (errrr, his secretary actually) would respond to you via form letter once your certificates were dispatched. It's interesting that war stamps were still being discussed seven years or so after the end of the Big One. It also looks like inflation was rearing its head as well. 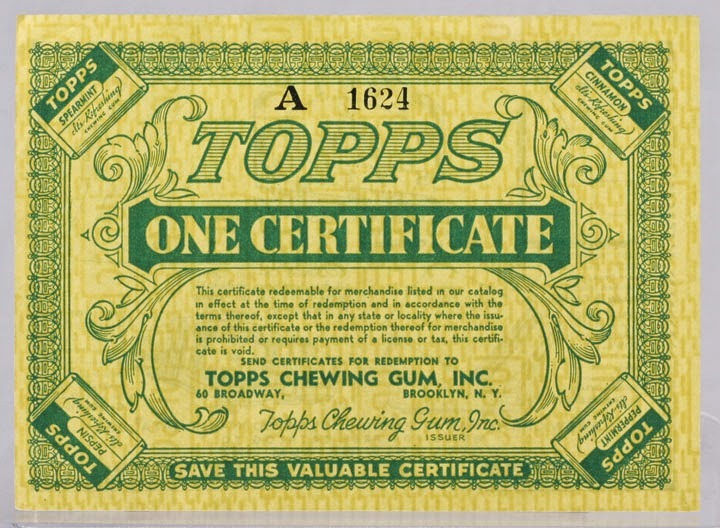 The supremacy of Bazooka is on display here; the original certificates lost their Topps Gum headings and changed over to Bazooka by the mid 50's although they flip-flopped sometimes before going over to Topps Chewing Gum later on, probably in the 1960's. This certificate has no expiration date, a situation they would eliminate pretty early on in the process. The earliest expiration date I have seen is January 30, 1944. That one also had 60 Broadway as the address so the one above is quite early as its A 1624 registration number also attests. 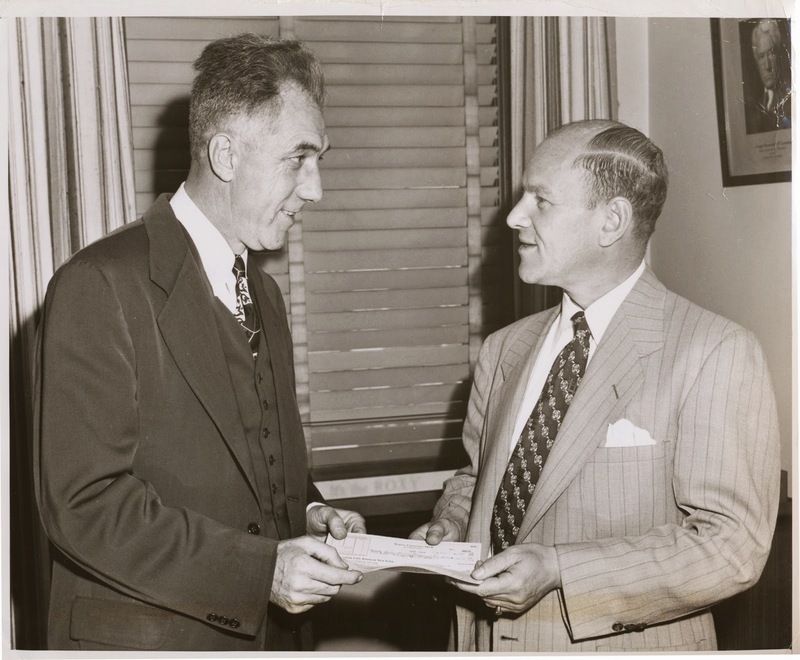 The main group of certificates switched to a format where the letter followed the numbers and was in place by the time the 1/30/44 expiry certificate was issued. 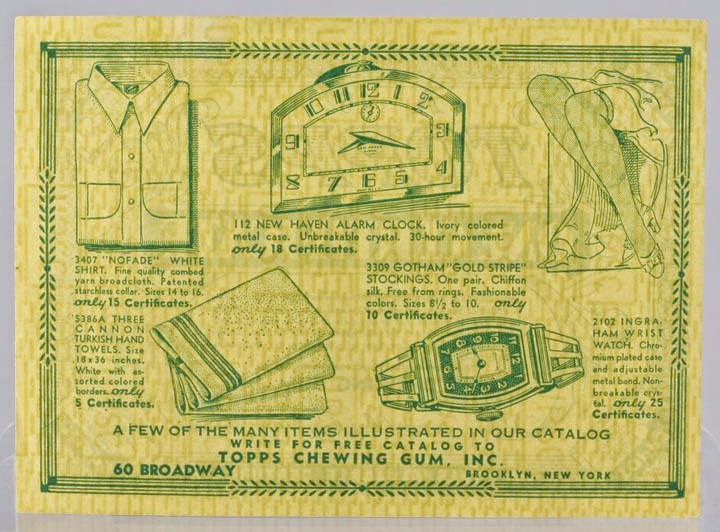 The paper is of a type used in the securities field at the time so these certificates were considered to be as important as cash to Topps, almost like a bearer bond. So anyhoo, the certificates had to be collated and once that happened a receipt was filled out and sent to the lucky recipient. Can you imagine how much paperwork was involved in this operation?!?! 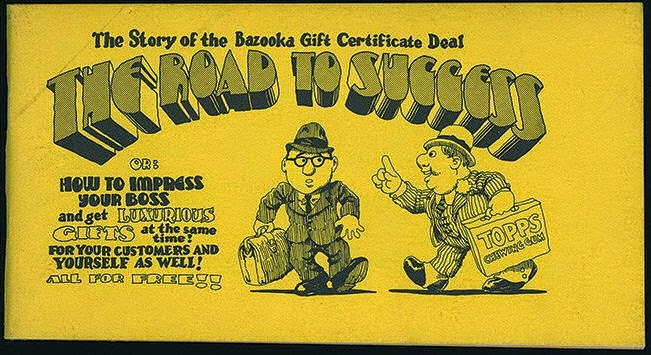 I'm not sure when the program was halted (if indeed it has been) or switched over to some digital or online format but I have some certificates from the mid 1970's, although they were called Gift Certificates by then. They still had registration numbers on them and were validated by the Topps treasurer. The security paper was long gone by then though. A large trove of Topps corporate items have just arrived here at the Main Topps Archives Research Complex, among them old sell sheets and some other goodies that will be the subject of a few upcoming posts. 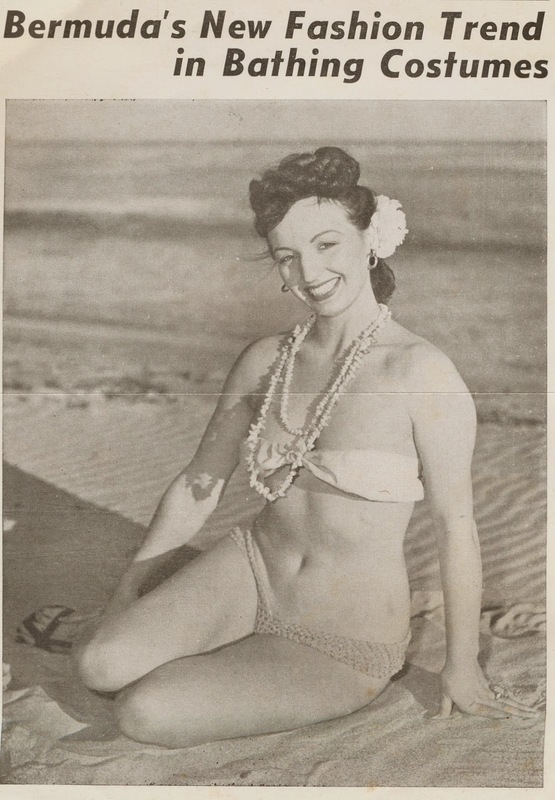 There are also about a dozen publicity photos and I thought I would share some of the better ones today as much of the material is going to require a camera and will take me a while to get up on the blog. 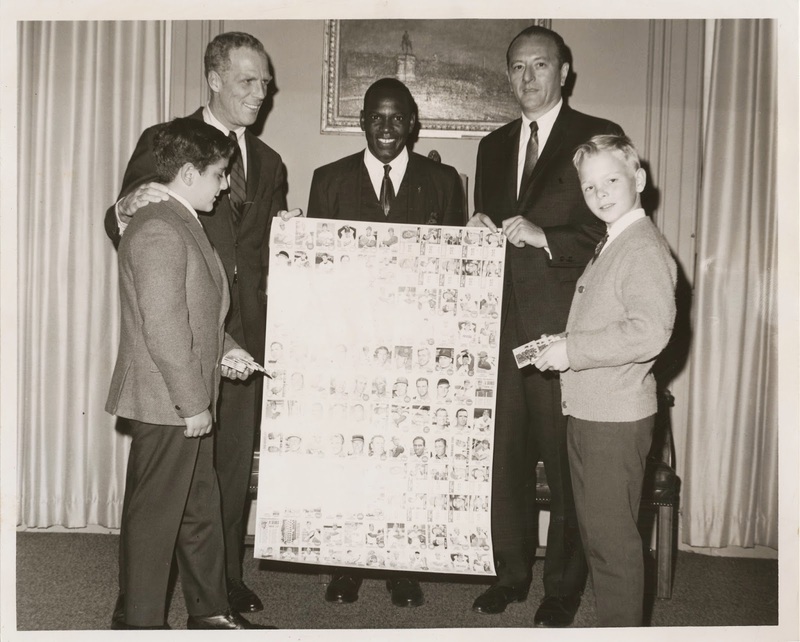 Those kids are holding 1968 wax packs by the way. 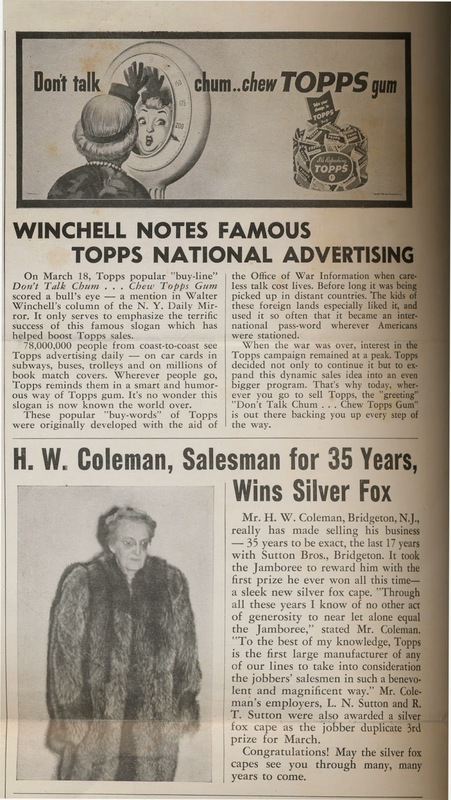 Topps and the Shorin family were always major civic and civil rights supporters, stretching as far back as I have been able to find. 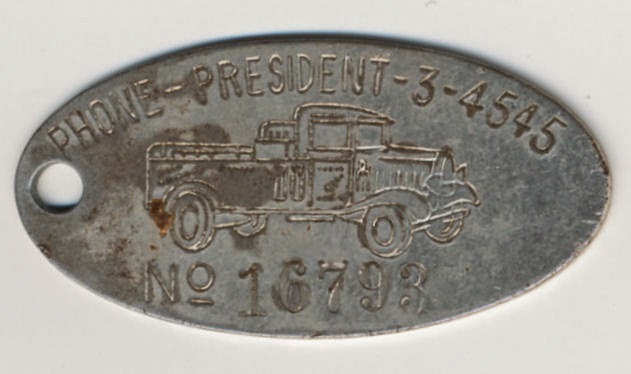 This also came with the transcription disc aircheck of the broadcast (or at least the ad) from what I believe was a February 5, 1949 radio broadcast of their Saturday morning children's show (the disc is dated February 7, 1949). It's a shellac 78 from the looks of it and the darn thing won't spin on my CD player. This is just before the dawn of widespread television viewing. It has been an auction season of mixed success for your intrepid webmaster. I've won some nice, old Topps companion pieces, made some purchases (some of which will be featured here in future posts) and lost out on some really nice items. 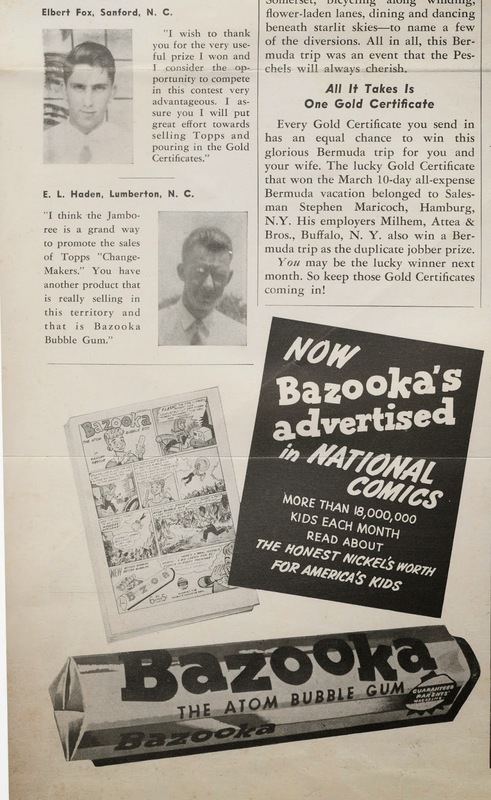 My most recent whiff concerns some Robert Crumb sales material produced for Topps in 1965, during his first foray to New York where Woody Gelman reeled him in for a short time after a hoped for job at Harvey Kurtzman's Help! magazine fell through. 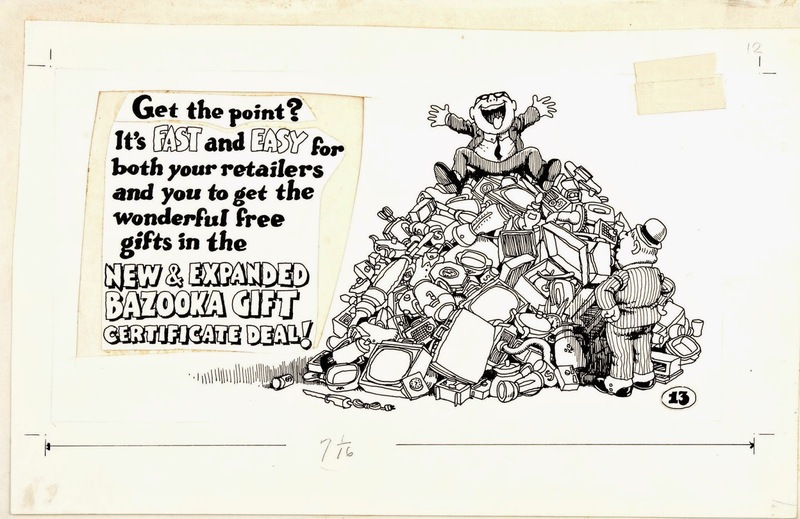 Much like his work on Monster Greeting Cards, Crumb's style was not fully developed in 1965. 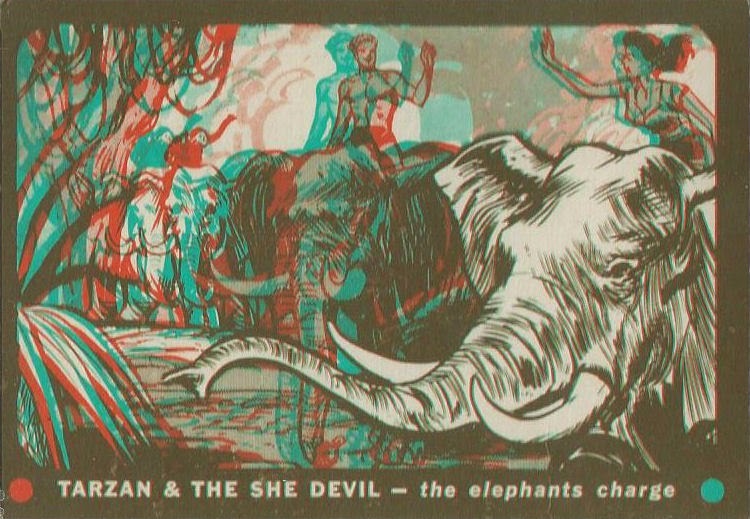 According to the man himself, he didn't start drawing in the style for which he is known now until after he started experimenting with LSD in late 1965 into mid 1966. I am curious if his LSD adventures were shared with anyone at Topps! I love the old pasteups; everything was done manually back then. I'm of the opinion that original Crumb artwork is moving into that magical realm of high end art collectors, if it's not there already. He's going to be looked back upon as one of the 20th Century's major illustrators and artists.